The Internet is awash with screencast tutorials that show you how to do everything from completing Angry Birds, to mastering layers in Photoshop. These projects might seem as though they require expensive software and hours of video editing, but they're actually a lot easier than you might think--especially if you use a free Web tool like Screenr.com. Screenr is undoubtedly among the simplest and most effective of the many screencasting tools available today. It requires no software downloads, so you can be up and running almost at once. 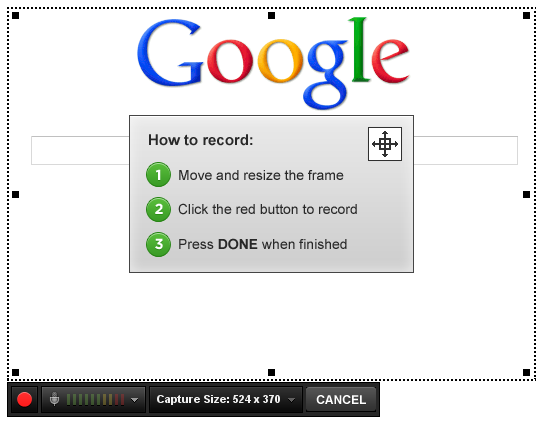 Just press the Record button on the homepage at Screenr.com, and wait a few seconds for the recording frame to load. Once you're ready to record, click the microphone to ensure that you have the right audio device selected; then click the red button to start recording. A countdown appears--and when it's over, you're live on the air! You have up to 5 minutes of recording time, but you can stop and reposition the window at any time by clicking the pause button and moving the frame as you did before. When you're finished, click Done, and Screenr will take you to a video preview of your completed screencast. If everything is to your liking, you can add a description and publish it to your account. From there, you can send it to Facebook and Twitter, or get a URL code to share the screencast with others. Other options include finding an embed code to use for blogs and websites, publishing it to YouTube, and even downloading it as an MP4 file. There is currently no limit to the number of screencasts you can record, and resolutions of up to 2560 by 1600 are possible on a PC. Screenr videos are public on the Web, but you can deleted any that you post whenever you want. So if you're looking for a quick and easy way to record your screencast for free, check out Screenr.com.